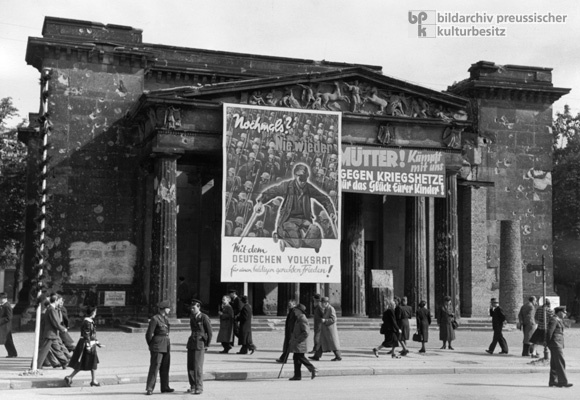 The banners featured in this photograph ask Berliners to support the “German People’s Council” [Deutscher Volksrat] established in the Soviet Occupation Zone in 1948. The People’s Council, which was constituted at the Second German People’s Congress in 1948, regarded itself as a preliminary all-German parliament. It was completely dominated by SED members from the Soviet zone, however. Aside from its main task of drafting a constitution, the People’s Council also addressed the matter of negotiating a peace treaty in one of its committees. The banners on the war-damaged Neue Wache anticipate the SED's Cold War era peace propaganda insofar as they present the People’s Council as the only guarantee of peace. The larger banner on the left shows a disabled war veteran in front of an army of troops; it reads: "Once more? Never Again. With the German People's Council for an immediate and just peace" ["Nochmals? Nie wieder. Mit dem Deutschen Volksrat für einen baldigen gerechten Frieden!"]. The banner on the right reads: "Mothers! Fight with us against war-mongering for the sake of your children" ["Mütter! Kämpft mit uns gegen Kriegshetze für das Glück Eurer Kinder!"]. Photo by Herbert Hensky.